Today we departed home base Luray at 8:10am heading for Tazewell VA (located in the southwestern mountains of Virginia) Our flight conditions at 8000 feet were clear and smooth with a very slight tail wind component, the outside air temperature was 40 degrees. These conditions continued until we were about 40 miles out from Tazewell, at which point they quickly made an abrupt change….. the winds began to increase considerably from the southeast and the clear skies we had been flying thru now turned to cloud layers consisting of scattered, broken and solid. All of this was of no surprise, our preflight forecast had shown a large low pressure system moving towards Virginia from the southwest with a very impressive counter clockwise flow, and Tazewell would be near its leading edge around the time we would arrive. Prior to departing home base, the winds were already reported gusting to over 30knots at Tazewell while at the same time our wind conditions departing Luray were calm! We requested and received an RNAV 25 approach into Tazewell to get down thru the clouds. Once on the approach and descending, we broke out of the clouds at around 2500 feet AGL (Above Ground Level) all the while experiencing fairly strong turbulence. With this system the winds at 3000 feet were very intense from the southeast, which had them flowing over the ridgetops and straight across the runway at Tazewell (Tazewell actually sits right on top of a mountain ridge)…. this combination of wind and terrain creates many erratic up and down drafts while at the same time the strong flow is trying to push you sideways, then to top it off, add in the gust factor and you have a perfect scenario to put your crosswind/power control piloting skills to good use …….. and Captain John done just that, bringing 49Bravo down on to runway 25 in a manor that kept us aligned without being pushed off in winds that would make a sailor hide! Captain John many times has commented that he is teaching me all his bad habits, and I quickly respond to that by saying that if you are referring to what I see as unbelievable experience from over 75 years of flying….. then I will gladly absorb them all! Once we powered down and secured, it was even hard just to open the doors with the gusting wind. As we walked inside the FBO we were greeted by our passenger Alva (Lee) and his friend that had brought him to the airport. Of course one of the main topics of our conversation was the wind, and we reassured Lee and his friend that though the takeoff and climb out would be fairly rough, we had no safety concerns with leaving. We also mentioned that as bad as the conditions seemed to be here at Tazewell, they would quickly improve as we headed away from this system on our way to his destination of Charlottesville VA ….. where winds were being reported at less than 5 knots! 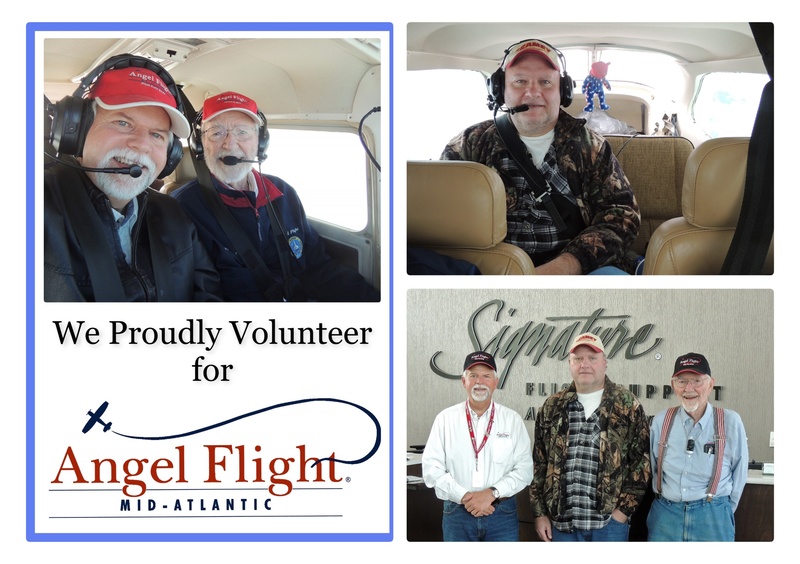 We had flown Alva in the past and we felt sure that he valued and trusted our decision, so after our goodbyes to his friend and the FBO manager we loaded up for our flight to Charlottesville. At home base Luray we made a visual approach and landed on runway 22, the winds at Luray were still very light. After tucking 49Bravo snuggly back into her hanger, we enjoyed not only a nice hot cup of coffee, but also our lunch…. all the while discussing things of much importance. What a Great Day It Was to Fly!…… actually, any day that ends in “y” is a Great Day to Fly! Our total flight time for todays mission was 4 hours covering 394 nautical miles. This was Angel Fight Mission number 423 for Captain John and Angel Flight Mission number 293 for me (Nevin). This has certainly been a year thus far for a record number of flight cancellations……. just this month alone we have had a total of seven Missions canceled for various reasons, all of which were beyond our control. Many are multiple leg Missions requiring more than one airplane, and on these, if one pilot drops out it can cancel not only the entire mission for that day, it may also cancel the return flight days later. Others have been canceled by medical appointments being changed or the passenger not being able to go when the time comes. But, as always, we sign up for any mission that we can do and flight plan it from that point on as it being a go, then, go or not we are standing by and ready. Thanks so much for interest in our flights! Hope you enjoy the following photos….. Have A Great Day! Thanks so much for viewing ! Very nice to be following your flights once again. Keep them going, I knew you would get a picture of the Virginia Univ, I couldn’t believe the traffic at CHO. Jets coming and going and you in between. Stay safe. Thank You!……. Yes, CHO (Charlottesville) was very busy that day! Your comment showed up as anonymous……. would this be Tom? I was wondering when I would see another report–you have had a lot of cancelled flights. Nevin, you wrote this up really nice. I see you have learned a lot from the man! I really enjoy the photos and the narrative. You fly in some pretty and interesting country. Makes me nervous to see you landing and taking off in those gusty crosswinds. Good thing you know what you’re doing. Sounded like a terrible challenge at Tazewell. Thank goodness for such a capable captain! Hope to see you again sometime when the Powell’s are flying.